Methodist biblical scholar Margaret Barker has recently shown that seeing God face-to-face was one of the original purposes of the temple in ancient Israel during the First Temple period (Solomon’s Temple) and before4. 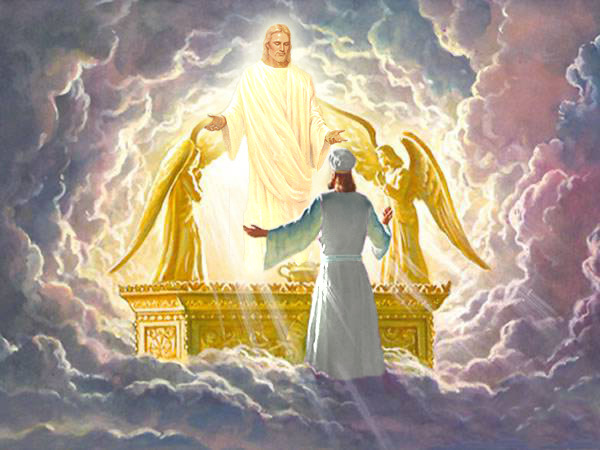 The heavenly ascent to the throne through the temple was rewarded by a face-to-face meeting with God, a fact that was later suppressed and edited from the Bible by a group known as the Deuteronomists. Indeed, the Bible is correct “as far as it is translated correctly”5. But what does it mean to see God face-to-face, or to see the face of God, or to even “be in God’s presence” when we go to the temple? Should we expect to see God physically with our eyes when we attend the temple? While this may be one of the meanings of the phrase, I believe there are several ways we may interpret this, and which may help to give us a fuller understanding of our temple experience. I will attempt to go into more detail about each of these, and there is some overlap. This will be a series of posts, this first article focusing on the first point of literally seeing God, the Father and/or His Son, Jesus Christ. It could be said that Joseph’s purpose ever after this event was to help others, the Saints, have the same revelation. It was to bring them back into God’s presence, and to see Him. This was what the temple was to provide, and it did and has so provided. The veil was taken from our minds, and the eyes of our understanding were opened. We saw the Lord standing upon the breastwork of the pulpit, before us; and under his feet was a paved work of pure gold, in color like amber. For behold, I have accepted this house, and my name shall be here; and I will manifest myself to my people in mercy in this house. When the Savior shall appear we shall see him as he is. We shall see that he is a man like ourselves. Is it a common occurrence? Probably not. The early Saints had to prepare themselves substantially before such a manifestation was given them. In today’s parlance we might say that it is upon making one’s calling and election sure, receiving the more sure word of prophecy, and the Second Comforter, that such a revelation could take place in the temple. But it is certainly not unheard of, and it was one of the primary reasons the temple was restored in latter days. It is precisely what Joseph desired for the Saints in building the temple. It is curious that we do not discuss this aspect of the temple more often today. We often teach that the temple is where we can go to be in God’s presence, and to feel His Spirit, but not necessarily to see His face. What are your thoughts about that? Please share with us in the comments below. I remember hearing about the ceremony in the temple of receiving the Second Comforter. Members are invited to the temple to have some one-on-one time with the savior. The frequency of this ordinance is unknown, but wouldn’t be too surprising if several people in a stake had received it. Also, the First Vision wasn’t made public until the saints were in Nauvoo. Parley P. Pratt printed the account in England, which got back to the States. Joseph Smith then confirmed the account to the church. I believe the reason why we don’t hear of the prophets’ personal accounts with the Savior is because they are very sacred, very personal experiences. A prophet might choose to share these experiences with close friends or family, such as the Quorum of the Twelve, or a young granddaughter. If anyone has any references to the examples I just gave, I would love to have them. I think some of your examples demonstrate that seeing the face of the Savior is not the same thing as making your calling and election sure. Another great post, Bryce! This topic has been on my mind a lot lately and I consider this information coming to me right now as a great blessing, personally. Thank you for your efforts. You’re welcome Steve. I’m glad it was useful. Hopefully the other installments will be likewise. I find this topic fascinating for many reasons, but one of them is that this is definitely the kind of experience that we don’t hear much about anymore in the Church. I agree with Cache that part of the reason for this is the sacred nature of such experiences. But I also think that our modern minds have become cynical and quick to mock. What would our reaction be if we did hear from someone close to us that they had seen the face of God, or of Christ? And was the sharing of such experiences a necessary part of early Church life? Was this something the early saints needed to strengthen them as they pioneered this new faith and sacrificed so much to live it? I think we need more reminders (like this post) that coming face to face with God is not an false promise. It is something very real and very possible. Great post, Bryce! I am planning to speak about this very subject, but in relation to Solomon’s Temple, at the Expound Symposium on May 14th. I believe that “seeing the face of the Lord” was one of the key paradigms of the pre-exilic ritual system of the First Temple. I see as evidence of this a number of the Psalms and other scriptures that describe the appearance of the Lord as the climax of the principal cultic ceremonies. Although this idea is later obscured, in earlier tradition there was often the expectation that the Lord would appear in his sanctuary, and I see temple visions such as Isa. 6 as reflecting this belief. I won’t say more so I don’t totally spoil my presentation! Thanks David! I’m looking forward to hearing your presentation! I’m sure it will be great. I haven’t yet seen the face of God in the temple but my wife and I have had several experiences where I have felt the presence of disembodied spirits and she has seen them. We were workers in the Preston England Temple and while we were officiating, with only the witness couple in attendance, I felt and my wife saw a room full of people! Great quote from Pres. Uchtdorf! Yes, I would like to make a comment about a fascinating book that deals with this type of a Temple experence that Joseph wanted us to work towards. The title of the book is called – Fathers. The actual title: The Testaments of the Twelve Patriarchs. The book was translated over 100 years ago by R.H. Charles who translated many Jewish Apocrypha/Pseudepigrapha books as they were discovered from Hebrew into something like King James style. The book has been updated since into a more modern style writing. The Testament of the Twelve Patriarchs deals with the Testimonies of the Sons of Jacob to their children before they died in Egypt. I found one Testament truly remarkable. The Testament of Levi to his childred before he died. I can see why Jewish scribes and leaders refused to allow early documents such as this one into their cannon due to the distinctinon and separation of Yahua the Son and God the Eternal Father. They would refuse to allow scriptures showing a belief in plural Gods even if it was from – Abraham, Issac, Jacob or the Sons of Jacob. Levi gives his testimony and tells of a type of Temple Ordinance experence he has had with Yahua and refers Yahua as the Messenger sent from God the Eternal One. Yahua, the Messenger, will come and save Israel and the whole human race from death. Yahua has chosen Levi to receive the Priesthood and is taken up to see the 1st, 2nd and 3rd heavens where God the Eternal lives. Yahua clothes Levi into the holy robes of the Priesthood and later testifies of the future events of the House of Israel and it’s Priesthood Temple distruction. He fortells of the Priesthood being given to the Gentiles and this Priesthood will never be taken from the earth until the children of Levi due offer up a sacrifice. Once again, Bryce, you have written an excellent post. Surely the sacred nature of such experiences, combined with growing attention from outsiders and nonbelievers contribute to the reason we don’t often hear these accounts. Thankfully, I have been blessed to hear the witnesses of others who have had meetings such as those in this post. What each of them seem to have in common is a remarkable degree of sacrifice to the Lord’s church in living a consecrated life. Perhaps that is why so many early church members obtained this experience and we don’t seem to. I loved this post — it is uplifting and comforting to know that my feelings about this are not singular. Thank you for putting all these references in one place and not being hesitant to reveal some long lost, but encouraging doctrine in a time when we must seek out these things on our own. Awesome post, I look forward to the next parts. This is a topic that I find very interesting, and I had actually started a thread over at Mormon Dialogue forum about the presence of God in the temple two weeks or so ago. Being in the presence of God has always been an important part of temples, and I love that our latter-day temples have that connection (among others of course) with the ancient temples. And I agree with your last paragraph, that it is frequently said that in the temple we are in the presence of God and can feel His Spirit, but the “face to face” aspect isn’t as prominent. A fantastic article. It provides an impetus to attend the Temple as often as possible. I have always had a deep love and reverence for the temple and am grateful for inspiration and insight into that great gift we have been blessed with. I go as frequently as I can and always feel like I’m coming Home when I go – not just home, but Home! Besides the great scriptures you’ve mentioned in this article, especially those from the D&C, I’ve always thought that the Savior was also alluding to a personal manifestation in John 14:21 & 23. Thanks again for this wonderful post. What I do like about the doctrine of seeing the face of God is that it inspires me to be (more) pure and holy. I want to get rid of all the unclean thoughts and practices in order to qualify for that blessing. Nowadays, thanks to the Priesthood, we can comune with the Lord if we meet the requirements cited in D&C . It has not always been this way : we are very blessed people. A very inspiring post! Thank you, it brightened my day. I don’t believe the ordinance of the second endowment is the same as having your calling and election made sure. and devotion in leadership callings and who are then invited to receive this holy ordinance. If they genuinely are all they claim to be and have been invited to receive this sacred ordinance by the First Presidency then they would of course also qualify to have their calling and election sealed upon them through the Second Comforter – to behold the face of the Lord. The outward ordinance does not, however, guarantee the receipt of the revelatory confirmation. We know this from at least one leader in the UK who apostasized with his wife after being disappointed that he did not see the Saviour in the Preston Temple after receiving the second endowment. Like all ordinances of the gospel of Jesus Christ the efficacy of this ordinance depends upon the sincerity and honesty of the recipient. Reversely, there are many humble servants of Christ who might not have been outwardly honoured by the Church but who have received the Second Comforter after proving themselves in every aspect of their lives.